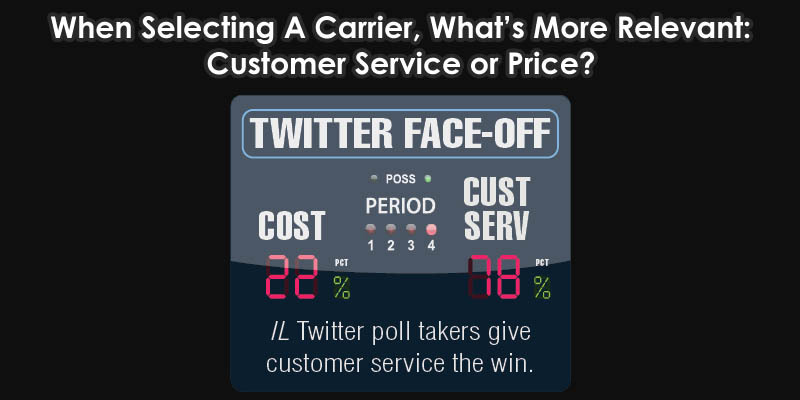 Selecting a Carrier, What’s More Relevant: Customer Service or Price? Depends on the product. I’ve seen many examples of companies having “low-price” carriers that are never used or consistently over-ridden when the TMS selects them because the planners know the carrier’s service is less than acceptable for the product being shipped. This is possibly the most difficult question we face on a day-to-day basis. Some shipments couldnot be late and service becomes the most important aspect of the move. There are other shipments that do not have a strict deadline (or are ready early) and price then becomes the most integral factor. We help our customers identify when and where each is more relevant and where price savings exist. Who says you could’t have both? We’ve found that many of our clients are constantly looking for better pricing while expecting excellent customer service. As the market and its associated prices change, service providers must find new ways of composing RFPs and RFIs in order to remain competitive and provide clients with a satisfying level of price and customer service. Determine the appropriate trade—off between the product price or service and the levels of service that will keep your internal customers satisfied. Negotiate a deal that meets your stakeholders’ minimum service requirements at the lowest total landed price. In the business world, competition dictates service needs, and service needs dictate price. Thus, buyers will set service requirements, and that will dictate price. So customer service comes first, and price follows. While both are equally important, I would side with customer service. Many companies are ok with paying far above the market value in return for reliability and service performance for their loads. Price is generally a key consideration, because if the price isn’t in the ballpark, the level of service is essentially irrelevant. However, once the price is in range, significant differentiation on service could often be the deciding factor. Hands down, customer service. Chasing the lowest price often has prices of its own, whereas the partnership that comes from true customer service always drives long-term value. And when the market changes, you’ll benefit from having a trusted partner with mutual goals. It’s about achieving the right balance between the two and mapping the supplier’s offering to the objectives that will contribute the highest level of success to the business. In light of this, value service received divided by the price paid… Trumps price. It is just as important – if not more – to choose customer service over price. A 3PL provider with exceptional service and account management could bring a wider scope of benefits – including price savings – by improving efficiencies and your managing risk. Bang for the buck. There are a lot of providers, customer service levels could be insanely low at even the higher-priced vendors. Service providers should stop thinking they could charge a premium to be 50% reliable. You want to charge a premium? Then you absolutely must give 90% reliability—anything else, you’re the same as the low-price provider. Customer service often outweighs price in logistics, especially when it comes to the accessorial fees added onto the back end of shipments. When you focus more in finding out all the information needed for a shipment, rather than giving the fastest, cheapest price, you could determine charges upfront. This gives your customer visibility and understanding of charges within the given rate, so there are fewer increases after the fact. I have found that releasing this info at the very beginning of a shipment, rather than the end, increases trust between you and your customer. Once a trust is created and accurate information is received, you could use your professional expertise to find unique options and create future price savings. While reducing operational prices is top of mind for businesses, customer service comes first to ensure rising expectations are met with improved visibility and accuracy—especially in today’s more and more competitive environment where loyalty has to be earned and options are many. Well, everyone knows “the customer is always king,” right? When making any decision, you must put customer service at the top or else you may not have a customer to serve at any price. When you provide great customer service, you don’t get caught up in the whole price/price discussion, but rather it becomes about value. Within a reasonable range of variance, service should trump price. The price of poor service could often outweigh any upfront price savings once you factor in back-office support, brand damage, or other soft prices. Great service builds customer trust and loyalty, which, after all, is key to any businesses success. We as suppliers and 3PL/4PLs shouldn’t ask our customers to compromise high service for lower prices. By closing the technical gaps (visibility, proven delivery reliability, EDI, etc.) between carriers, customers are able to reap both benefits, or should, if their provider follows a strict philosophy of continuous improvement. price may provide a cheap foot in the door but service is what keeps a customer for life.